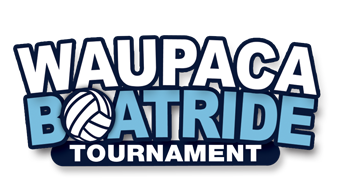 The Waupaca Boatride Volleyball Tournament began as a doubles tournament in 1984 at Whispering Pines State Park in Waupaca, WI. After several years of increased participation, the limited space at the park forced the tournament to be changed to a triples format to allow for maximum participation. This unique format provides a quality and challenging experience to players of all levels. After several location changes in the 90's and early 80's, the Chula Vista Resort in Wisconsin Dells, WI recruited the tournament in 2006 and it was held there until 2009. In 2010, the tournament moved to Oshkosh, WI. The tournament - held annually on the 2nd Saturday of July - has become much more than just your average Saturday volleyball tournament; it has become what many players refer to as "a family reunion". In keeping with that theme, the tournament committee has attempted to make it a fun-filled weekend for players, spectators, friends and family by adding Friday and Saturday night entertainment as well as 5 days of camping.